The new Fermonster fermenter eliminates the hassle of siphoning and is extremely easy to clean. Use the spigot to test and taste during fermentation and then when you are ready use the spigot to transfer your beer to the bottling bucket. No transferring and no siphoning. After fermentation is over drop in one of the included cleaning tablets. If you ever need to wipe it down the large 4" lid and clean straight sides make this the easiest to clean fermenter on the market. And a small but not insignificant feature we really love is the molded in level markers that tell you exactly when you have reached your desired volume. The clear walls also allow you to see the yeast "working" while the magic of fermentation takes place. Because the Fermonster is made from virgin grade PET (same material as 2l soda bottles) it will never break. 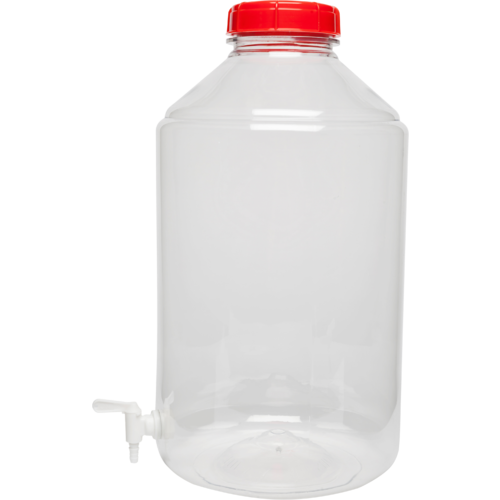 This is major safety feature when compared with heavy glass carboys that are very slippery when wet. Looked as it would fit my needs to get back brewing again. I am an avid home brewer. I am getting my friend into the experience. This is a nice starter kit. Christmas gift for my husband. He needs one more expensive hobby. 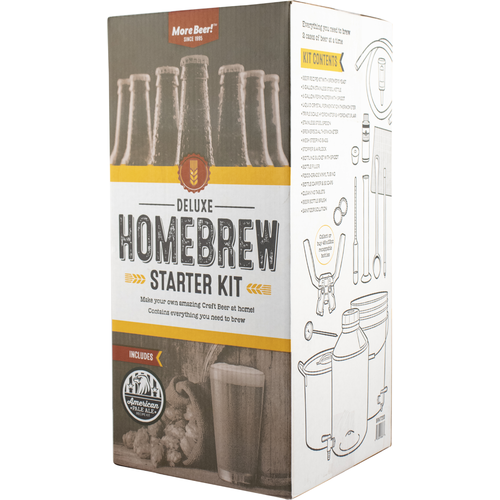 Looking for a kit to get started in homebrewing. First time home brewing. Plan to expand. After researching and redditing, this seems like the best kit to start. Also I was going to get a different companies' kit, but this kit has the kettle which is 40$ on it's own. Plus customer service was very nice. A friend and a long time brewer recommended it to me. Great Value at the Holiday's with the 20% off! It was recommended on reddit. 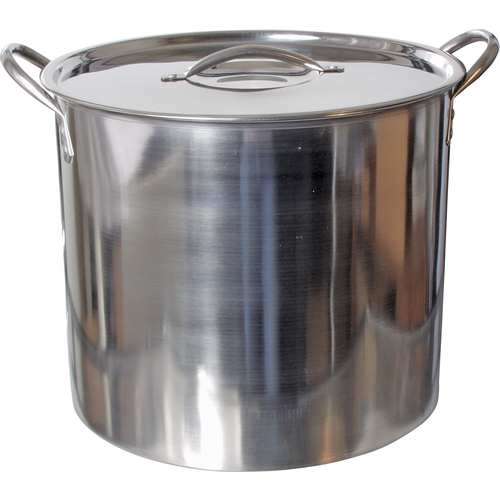 Recommended for beginners on home-brewing forum. Will this kettle work with an induction cooktop? BEST ANSWER: This kettle will work but the stove top takes a long time to heat six gallons would recommend ,anvil burner or such to war her up. Yes but what would take 25 to 30 minutes with a propane burner took at least an hour on the stove top. BEST ANSWER: The funnel is for the small opening on the fermenter. After you brew your beer pouring it into the fermenter, especially a glass carboy can be a challenge without one. Is my fermonster water resistant? I want to cover it in water and leave it fermenting with an aquarium temperature controller and I want to make sure that at the end of the fermentation it will still be in good shape. BEST ANSWER: Hi Victor - If the fermonster does not have a spigot, it can be submerged all the way up to just under the lid without the threat of water leaking inside. Does the spigot and/or bottling wand come apart for cleaning? BEST ANSWER: Hello David - The tip of the bottling wand can be removed and pulled off for cleaning. Some components of the spigots cannot be taken apart, however they can be separated from the vessel for cleaning. BEST ANSWER: Hello Victor - Dimensions are 13" x 13" x 29"
Can this kit be deliverd to Mexico? BEST ANSWER: Hi Victor - Yes, these can ship to Mexico. Kit worked great for starting out and has everything needed for running a batch. My hydrometer arrived broken but I called customer service and they had another one on its way that same day. Hi Dave - Thank you for taking time to write a review. Welcome to brewing! This has everything you need to start learning about brewing. It's the best kit to start getting into the brewing hobby. Careful though, it's like a gateway drug I am now wanting to buy all sorts of different extras for my love of brewing. It is a fantastic starter kit. I bought it as a present for a friend. It should give him a great start to his new brewing hobby. Great kit to get you started, cheaper than buying everything separately on eBay which is a shocker! Most of MoreBeer’s stuff is the cheapest you can find anywhere, but great quality. You get Everything you need to get up and running and a recipe kit to start right when you get it. I highly recommend this to anyone looking to start brewing, and especially if you’re on a budget like I am. Just bottled my first batch. The kit made it easy with the easy to follow instructions. Great starter kit with all I needed. Very pleased. Good quality parts. Brewing is going very well. The only issue has been the broken hydromoter. I advised customer support and they are sending a replacement. Great service. This is a very complete kit for curious people wanting to start experimenting with beer brewing. I’m absolutely satisfied and very impressed with MoreBeer customer service. Great way to make home brew. Easy to use and the instructions easy to follow. Had a good time making my first batch. It was good but only came with one gasket for the spigot. No matter what I tried the bucket and carboy were leaking. When I put one gasket on each side they worked fine. I highly recommend this kit. Has everything you need to get started. Also the company is very helpful. Great kit! Everything a home brewer needs to get started. Successfully brewed my first batch and I am hooked! Thanks Morebeer! Good ingredients, worth the money. This kit was a lot of fun, and definitely worth the price. The ingredients were high quality and seemed fresh. The yeast expiry date was several months in the future, and it was very active. Hops were pelleted and sealed under nitrogen in foil pouches. 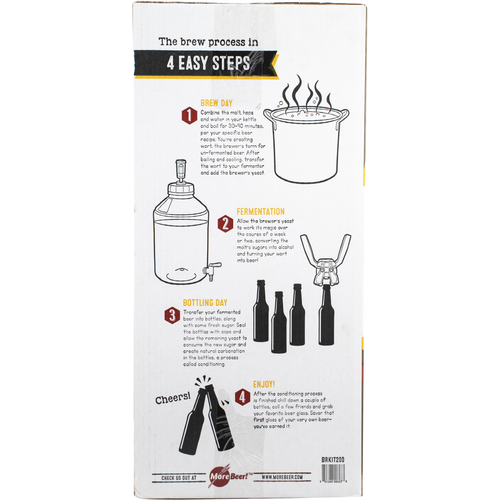 This is a steeped grain + extract kit, which yields good flavors without the hassle of messing with mash. The instructions were completely unambiguous, easy to follow, and a sheet was provided to mark down beginning and final gravity as well as other factors. If you’re going to use an electric stove to boil the wort, I would recommend pre-heating some of the water in batches in an electric kettle to speed it up. It took my dinky electric stove an hour to get to near-boil from cold water. Like other reviewers I had trouble getting the o-ring in to the lid. It’s almost impossible when it’s wet with sanitizer, so put it in the groove before sanitizing. As long as it’s cleaned before hand enough sanitizer should get into it. If you still have trouble getting the ring to seal, you can wrap the lid seam tightly in Saran Wrap to seal it. Also, the rubber bung and the lid hole should be allowed to dry completely before putting them together, because it will readily slip out if wet. Those are my only complaints. All the equipment is good quality for the price, much of it is made in Canada and Italy. It seems like it will last for many more brewing sessions. Super solid beginner brew kit. It has all the basics needed for someone starting out. You really can beat the price for what’s included in this kit. I started with it and then bought ingredients separately to brew new batches. So far, I’m not at all disappointed with my choice to go with this kit as my starter. This was my starting kit and I made a lot of beers with it (well, I expanded the equipment as I brewed, but this was the start). I like what it has, I might have gone with a bucket with spigot instead of better bottle though since I like to clean it with my hands and they can't reach inside the bottle. Also, the spigot is nice and I actually use the bottling bucket more for fermentation than bottling - being able to just dump the beer through the spigot instead of other means is very nice. The packaging is NOT discreet. Entirely ruined a surprise. Great start, but don't forget the lid! Quite happy with this set; had my first brew day a couple days ago and things went without a hitch! 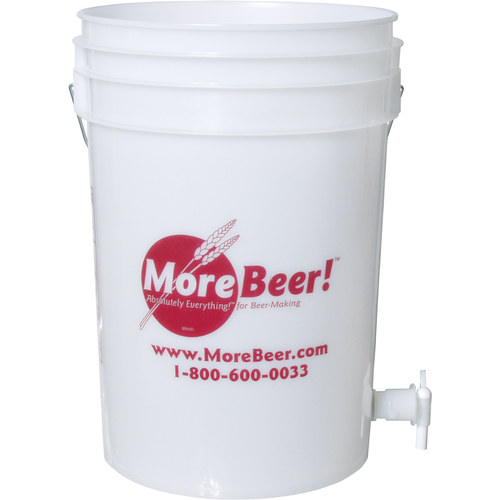 Buyers should note that the primary fermentation bucket doesn't come with a lid – this was unfortunate to discover, since most brewers will probably need one (unless you plan on doing open fermentation). There is also no racking cane, and contrary to the description of the product in the booklet, the kettle doesn't have a spigot to attach the tubing to for transferring into the primary fermentor, so it took a few tries to get a handle on how to siphon with just the tubing itself. Not a big deal, but folks may want to add these items to their shopping list when heading to their local homebrew store. 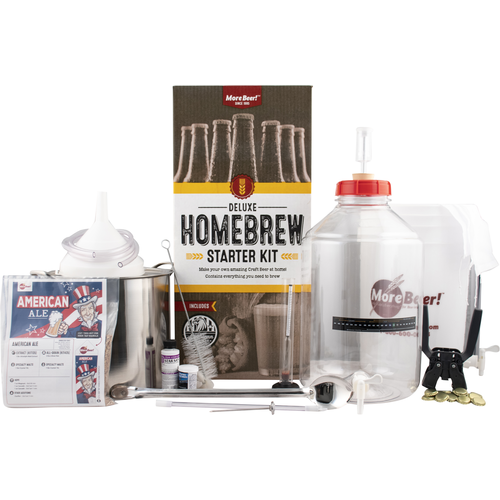 In all, a great kit with pretty much everything you'll need to get your first brew started! Hello Lex - Firstly, thank you for your review, we are happy to hear you're enjoying the kit. If we could add a few notes and suggestions for you to better utilize the equipment provided. Primary fermentation should occur in the clear plastic 6 Gallon, Fermonster. This provides a sealed environment for first and secondary fermentation, and spigot for racking into the MoreBeer! bottling bucket with spigot, negating the need for a racking cane. In this bucket you can add and stir in priming sugar with the sanitized stainless spoon, then siphon to final packaging in bottles of your choice. If you ever have any questions about these kits, or any of the equipment we provide, please give us a call at 1-800-600-0033 or email us at info@moreflavor.com so that we can assist you. Love it. Everything you need and more to start home brewing. Highly recommend this kit. Best products and great price. Patiently waiting to try my pale ale and looking to BIAB smaller batches for my next brew day. Definitely pull the trigger on this one. This was very easy to setup and brew with. Nice little kit to get me back into the swing of things. Solid ingredients, equipment is poor quality. I just bottled the brew from this kit and while all the ingredients came as expected and seemingly of high quality, the actual equipment was poor throughout. The O-ring for the carboy was to large (luckily it didn't effect this brew but I will need to replace it) and the bottle capper a) doesn't work on any non-traditional bottles (think Lagunitas bottles) and there is no warning about this. It would have become an issue if the capper itself hadn't broke after about 30 bottles leaving me with 1.5 gal of beer and no way to bottle it. Very frustrating and disappointing way to be introduced to brewing. Hello Andrew - Apologies to hear about your experience with BRKIT200, we try our best to compile a kit that gets folks into the joy of homebrewing, while not breaking the bank. As far as the Fermonster O-Ring is concerned, here is great video https://youtu.be/E2g8rmuF6G0 explaining how to install them. With the Gloria capper, it should still be able to cap heritage style bottles, since they use the same size crown, but may require a bit more finesse. We hope this experience hasn't discouraged you from homebrewing, or our website; if you ever have any questions or concerns, please give us a call at 1-800-600-0033 or email us at info@moreflavor.com so that we can assist you. It basically has everything you need. Beer turns out well. Awesome kit, easy to use for our first brew. 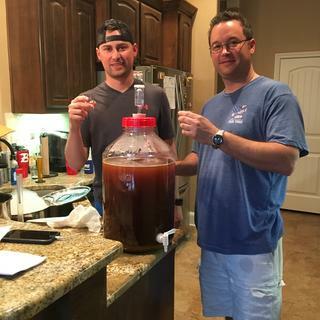 Had a blast brewing with it! Tasting the sweet wort before the yeast is added, can’t wait to taste the final product! Was missing one spigot washer and my Malt bag was punctured resulting a lot of parts got sticky...Hee.Hee ! Shucks, not a big deal . I am still so very pleased with outstanding results and great equipment. I will be a solid customer as I grow... Thx more beer! Good way to start out. Everything I needed to get started and the customer service has been awesome! I liked how well the process was outlined for someone like me who doesn't really have much idea of what they're doing. The general "recipe" sheet versus the one that was in the actual extract kit had some slight differences, but nothing that couldn't be figured out when read ahead of time. The starter kit includes everything it claims to. I ordered multiple extract kits and received one incorrect packet of yeast, which was corrected by MoreBeer immediately. Great staff to work with. Great starter kit. Easy to use. Very easy yo usé and great recipe! I love this kit. It started me out with everything I needed to learn to brew on my own. I have recomended it to frirnds and co-workers. A great starter to teach anyone. This has been a wonderful piece of equipment for my start into this hobby. As with other reviews I notice issues with the airlock sealing properly but this has had no impact on my brewing attempts as of yet. Let me start off by saying this kit is excellent! My wife got me this for Christmas and I'm already a week into the fermentation process, can't wait to try the beer! I had a couple of small issues with my kit: the metal spoon came with a bunch of black gunk all over it. It took me a LONG time to get it clean. Also, the kettle is fairly thin. It did the job but I'm going to be looking to upgrade the kettle soon as it didn't seem to sit flat on my glass top burner when it had a couple of gallons in it. I can't emphasize enough how much heating power you lose when you aren't making full contact with a burner. That being said this is a wonderful kit. The instructions were very informative and so far the brewing process and fermentation process has been going as planned. As the title of this review says, I would go with the upgrade if you can afford it. I have already purchased an immersion chiller for my next batch and I will be looking to purchase a 10 gal kettle with a spigot in the very near future. The upgraded kettle alone will cost you the difference in price between this kit and the next kit up. Overall very satisfied. This is the first home brew kit i ever bought. It came with everything i needed to brew my frist batch of beer and it was great! The directions were easy to understand, and i had no problem following them. This kit will continue to brew me many different kinds of beer far into the future. It is designed to add items to it with ease. I would reccomend this kit to anyone who is just starting out in home brewing. I shoppwd around for 2 weeks and this kit came with everything and was cheaper that other kits that lacked items like the boil pot and hydrometer. Buy This Kit! I had participated in several brew days with different friends in years prior. So I had a pretty good idea what was needed to get started. My fianc? bought this for me as a Christmas present and now I'm hooked! This kit really isn't lacking anything that one would need to get into this hobby. 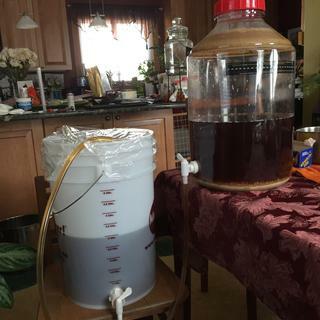 I brewed the irish red that came with the kit and it turned out great. The fermonster, 6 gallon fermenter is great. The o-ring in the lid is tricky to install and will appear too big, but it's not. The plastic spigot appears flimsy, but it has worked flawlessly and doesn't leak. My fianc? did splurge and get me a wort chiller (recommended by a brewer friend) and for that I was very grateful. Wort chillers are not 100% necessary for a partial boil, but help the process immensely. I also invested in a $15 metal blowoff tube for my second batch. Very glad I did! This kit kept things simple for a newbie like me. Great for getting confidence to expand your home brewery!